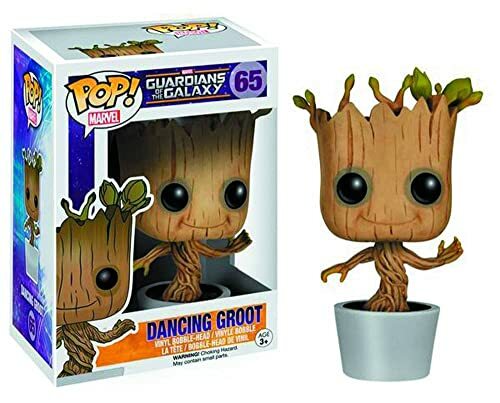 From Marvel’s fictional character this is Guardians of the Galaxy : Dancing Groot Bobble Funko Pop a Vinyl Bobble Figure! The Guardians of the Galaxy has been around since 1969 and with a movie finally made, Marvel gives the superhero team the Funko Pop! Vinyl treatment! This Guardians of the Galaxy Dancing Groot Pop! Vinyl Bobble Figure can dance along to your “Awesome Mix” on a desk or on your car’s dashboard with his bobbling head! The Dancing Groot Pop! Vinyl figure makes an essential addition to any Guardians of the Galaxy fan’s collection! Ages 14 and up. Groot is an extraterrestrial plant monster who initially came to Earth seeking humans to capture and study. Groot was seemingly destroyed by termites used by Leslie Evans. Xemnu made a duplicate of Groot that was used to fight the Hulk but it was destroyed in the battle. Groot was later revealed to have survived, but was a captive of the Collector and held in his zoo in Canada until Groot and the other captive creatures were freed by the Mole Man. Groot and the other creatures rampage in New York City until they are stopped by a band of superheroes, and are dumped through a portal to the Negative Zone. Groot was later tracked down and captured by S.H.I.E.L.D.’s Paranormal Containment Unit, nicknamed the Howling Commandos. While Groot was being held captive, Gorilla-Man talked to Groot about joining the Howling Commandos. When Merlin and his forces attacked the base, the Howling Commandos let Groot and their other captives free and they stampeded Merlin’s army; Groot was the only one to turn back and offered to join the Howling Commandos. Groot aided the Howling Commandos as they assaulted Merlin’s forces. Groot is a Flora colossus from Planet X, the capital of the branch worlds. The Flora colossi are tree-like beings whose language is almost impossible to understand due to the stiffness of their larynxes, causing their speech to sound like they are repeating the phrase “I am Groot”. Other beings try to be friendly but become angry with the Flora colossi for not being able to speak. Groot was shown to be capable of speaking not just understandably but eloquently throughout Annihilation: Conquest. The Flora colossi are ruled over by the “Arbor Masters” and teach the children of the species with “Photonic Knowledge”, which is the collected knowledge of the Arbor Masters of the generations and is absorbed through photosynthesis; this is a highly advanced education method, making the Flora colossi geniuses. Planet X’s biome is managed by “Maintenance Mammals” which are small squirrel-like beings. For fans of Guardians of the Galaxy, don’t miss this Guardians of the Galaxy : Dancing Groot Bobble Funko Pop. See details about this action figure.